The spherical inclusions inside geological layers do not take millions of years to form, Japanese scientists say. Concretions are eye-catching. Varying in size from peas to cannonballs, the almost perfectly spherical balls that erode out of geological layers seem almost too perfect to be natural. Science Daily indicates that scientists, not only laypersons, are mystified by them, especially when the remains of living things are found inside. 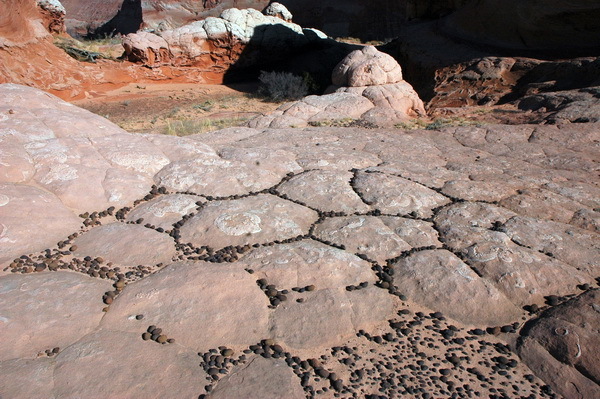 All over the world, spectacular fossils have frequently been found preserved inside solid, roughly spherical rocks called “concretions.” From geologists to casual observers, many have wondered why these hardened masses of carbonate formed around dead organisms, with round shapes and sharp boundaries with the surrounding material, typically in marine mud and mudstone. Japanese researchers, publishing in Nature Scientific Reports, think that geologists need to radically reduce their dating of these rock balls. The results of this new study dramatically impact understanding of the rate at which concretions form. “Until now, the formation of spherical carbonate concretions was thought to take hundreds of thousands to millions of years,” co-author Koshi Yamamoto says. “However, our results show that concretions grow at a very fast rate over several months to several years.” This rapid sealing mechanism could explain why some concretions contain well-preserved fossils of soft tissues that are rarely fossilized under other conditions. 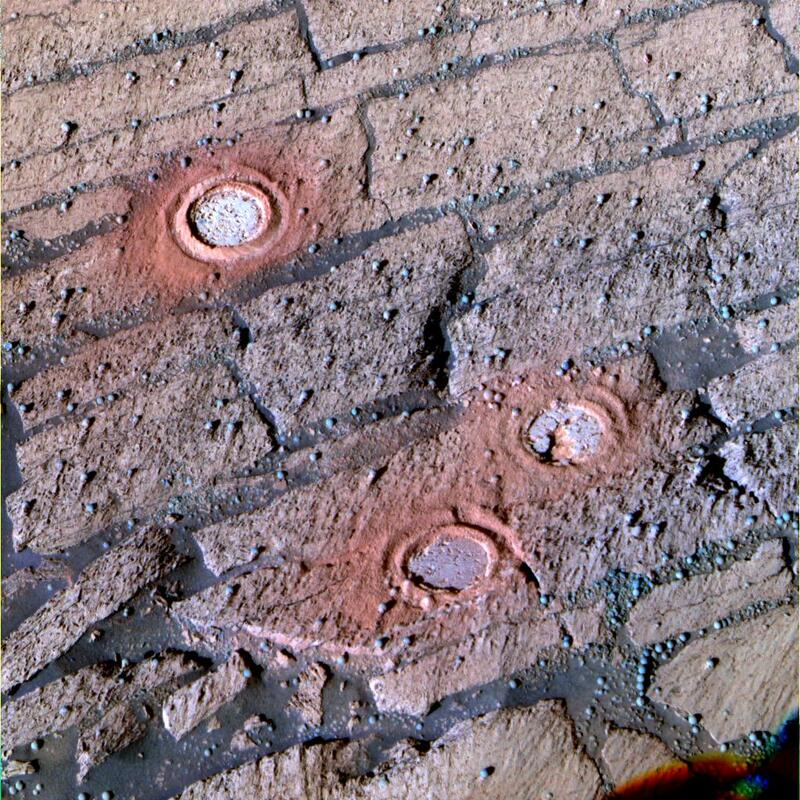 “Blueberries” – concretions on Mars (natural) next to rover drill holes (designed). The team evaluated concretions in Japan, England and New Zealand. Not all concretions contain fossils; small versions, dubbed “blueberries” by JPL scientists, have been found on Mars. Those are clearly abiotic, composed of hematite, an iron-rich mineral that may have precipitated from water seeping into bedrock. Similar-looking versions, from blueberry size to golf ball size, are found in Navajo sandstone on Earth, sometimes called Moqui marbles. They can be found in various stages emerging from the sandstone, and collecting on the surface. Because they are harder than the sandstone, they really stand out. 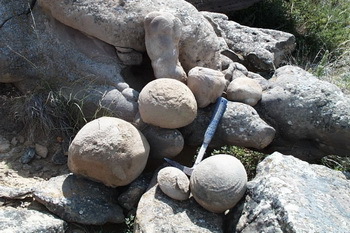 The concretions studied with fossils, however, provide an explanation for rapid growth and preservation. Even though the team studied only calcite versions, their model is general enough to be applied worldwide. Such a radical revision in formation rates, “at least three to four orders of magnitude faster than previously estimated timescales,” is bound to cause a stir among geologists who have assumed that concretions take up to a million years to form. The article also did not elaborate on soft tissue preserved in concretions, other than providing a reference to a 2015 paper in Palaios from the Society for Sedimentary Geology. Another long-age assumption bites the dust. Think about this! Assumed to take long ages, concretions can form in just months! Secular geologists were off by four orders of magnitude. That’s like going from 10,000 years to 1 year, or from 100,000 years to ten years, or from a million years to 100 years. That’s a ‘YUGE’ mistake! Spherical rocks can also be used as a test of intelligent design. Some spheres are clearly designed: the stone spheres of Costa Rica, cannonballs, and beads in jewelry. Other spectacular spheres can form naturally: concretions (some as big as cannonballs), “cave pearls” and oyster pearls. How do you infer design for a stone sphere made for a Roman catapult, but not for a stone concretion? Do you think we’re going to give you the answer? No; this is your exercise for the day. Test your knowledge of the design filter.